I don't know about you, but I am still fascinated by the space program. It is hard to believe that nearly 25 years have passed since the first artificial satellites were launched. They were about the size of a football, and just about all they could do was to go "bleep." But it was a start. 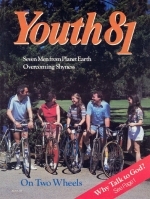 By the mid-'60s, when most readers of Youth 81 were born, we were getting used to the idea of man in space. The Gemini program was well under way, and this in turn led to the Apollo missions. It was the fifth manned Apollo mission that landed two men on the moon in July, 1969. Then came the heart-stopping days in 1970 when Apollo 13 was disabled on its way to the moon. The whole world held its breath for three days, waiting to see if the three astronauts could get back to earth safely in their crippled ship, and then breathed a collective sigh of relief when they did.